To ensure that knowledge generated by scientific research is used fully for economic growth and the well-being of all citizens. FCT’s mission is to continuously promote the advancement of knowledge in science and technology in Portugal, attain the highest international standards in quality and competitiveness, in all scientific and technological domains, and encourage its dissemination and contribution to society and to economic growth. 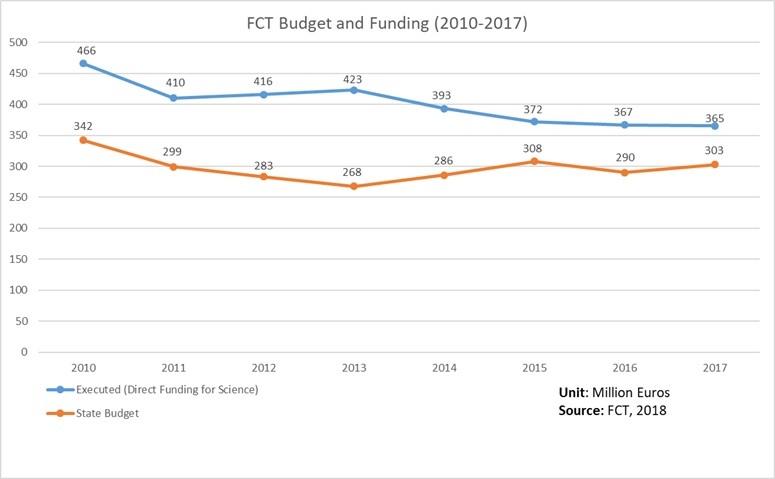 FCT pursues its mission through the attribution, in competitive calls with peer review, of fellowships, studentships and research contracts for scientists, research projects, competitive research centres and state-of-the-art infrastructures. FCT ensures Portugal’s participation in international scientific organisations, fosters the participation of the scientific community in international projects and promotes knowledge transfer between R&D centres and industry. Working closely with international organisations, FCT coordinates public policy for the Information and Knowledge Society in Portugal and ensures the development of national scientific computing resources. The results of FCT accomplishments are, in essence, the outcome of the work carried out by individual scientists, research groups and institutions that are funded by FCT. FCT’s budget encompasses funds from the Portuguese state budget and European structural funds. Most of the funding attributed by FCT is multiannual. The amount executed in each year reflects the funding granted in previous years. Likewise, the funding allocated through open calls in 2017 will reflect in the amount executed in subsequent years.